Delhi is in news again. This time not for Kejriwal or the CM but for its wierd for the past few days. It has been raining cats and dogs since last night in Delhi and parts of NCR – Faridabad, Gurgaon and Noida. This is supposed to be Delhi’s record breaking ‘Winter Rain‘ with over 50mm of rainfall last night. Many low lying areas have been water-logged. 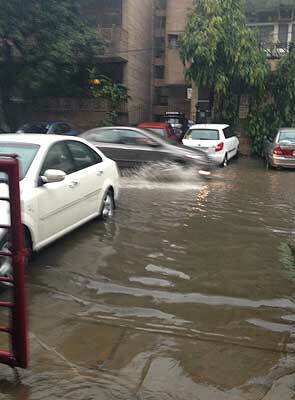 As far as Noida was concerned, it rained quite a lot too. There was a marriage function going on in the plot next to ours when the rain started. Wonder where did those guys run for shelter. It never seemed like winter, it was monsoon at it’s peak ! And that lead to power disruption that left many parts of Noida dark for quite some time. Even in the morning, there was no signs of the Sun coming up. With cloud covered sky, it was destined to rain heavily today. I don’t know why, but Tuesdays haven’t been great for me. Every Tuesday I get wet by the time I reach college !! And today wasn’t any different ! On my way to college, saw an accident on the Noida-Greater Noida Expressway. Even right now as I am writing this post, there is a slight drizzle outside and cool winds. Well, with such heavy rains and chilly winds, Delhi’s on the Chill !